During the time between Star Wars’ initial release in 1977 through the early eighties, there have been countless movies whose creation seemed to only try to cash in on the Star Wars’ success. Every one of these films would borrow/steal elements from Star Wars in ever increasing chunks. We have countless examples: like Disney’s attempt at live action science fiction in The Black Hole (which is genuinely awesome); Japan’s production Uchū kara no Messēji (Message From Space, which I have heard remakes certain scenes mimicking Star Wars (which should be awesome because of costume design and Sonny Chiba); and then there is Turkey’s Dünyayı Kurtaran Adam, who unabashedly used footage from Star Wars itself (which I doubt is anywhere near awesome). Star Wars changed the face of not only Science Fiction, but film itself; 1979 saw the release of a film that fits into the Message From Space category, that film, known as Star Crash is my focus tonight. 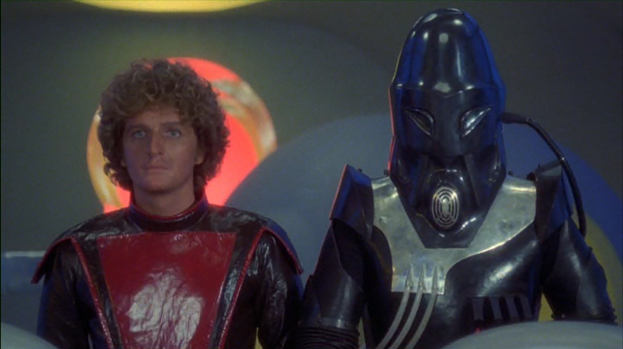 Originally a U.S. and Italian co-production, Star Crash was directed by Luigi Cozzi. Luigi Cozzi’s other works include Alien on a budget, Contamination, the Nosferatu the Vampyre sequel to Vampire in Venice, and Hercules (keeping up with the trend of Italy being home for all Sword and Sandal style fantasy films to be made). He has also written various films including Sinbad and the Seven Seas and Star Crash itself. Our story centers on the tag-team smuggling duo of ace pilot/poster girl Stella Star (Caroline Munro) and pro navigator/inspiration for The Greatest American Hero, Akton (Marjoe Gortner). As luck would have it, this spunky tag-team is being hunted down by spaces’ coolest duel laser pistol wielding robot sheriff Elle, whose ability to express limited emotions will not stop him from taking these two away in handcuffs. While escaping Elle through space, Stella and Akton find an Imperial spaceship. Thinking that they have time to spare, Stella jumps on board to discover that the ship’s crew is all but dead. She finds one survivor who she brings back to Akton, who spouts eligible nonsense about being attacked by red monsters (by this I mean that the survivor speaks no dialog and Akton for some reason just picks up on the details of the attack). Elle finds Stella, Akton and successfully splits them up to work lives on prison planets. But all is not lost since Stella Star is basically laser-proof. Stella successfully escapes her maybe six minute stint transporting reactor energy to an open system by starting a prison fight with the prisoners against the guards (no surprise there). She slips out the back while everyone is killing each other senselessly and finds an open spacecraft. But Elle waits for her arrival, gun in hand. He informs her that she and Akton were about to be let free to go on a mission for the Emperor (Christopher Plummer). Convinced, Stella and Elle release Akton from custody and team up to go about the Emperor’s mission. See, that ship they found earlier was attacked by the evil-for-no-discernible-reason Count Zarth, who was almost successful in eliminating the investigation team hounding him. But three escape pods where fired, and the Emperor believes that the ship’s commander, his son Simon, (David Hasselhoff) might be out there. Now Stella, Akton, and Elle must visit each one of these three planets, each filled with amazon warriors, dangerously cold climates, and crazed caveman. 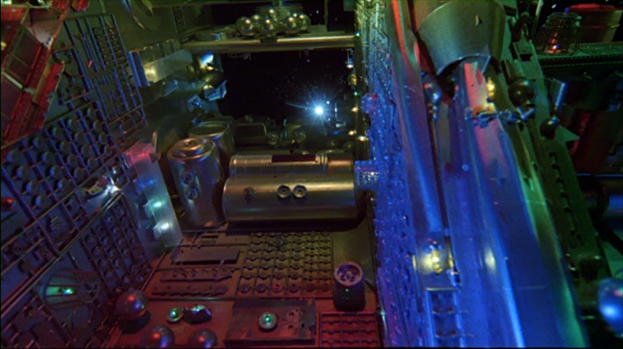 As you would expect from a movie in anyway related to space, Star Crash is filled with special effects. The effects range from “pretty good” to “that might just be the fakest thing I have ever seen put to film”. Star Crash will feature some relatively janky, but otherwise cool Ray Harryhausen inspired stop animation for scenes involving creatures like Count Zarth’s hissing robot swordsman and the amazon’s giant robotic protector. Plastic looking spaceships so covered in glued on pieces that each one could constitute its own page in an I Spy book. Shots across black sheets with holes cut out with light shown through to create stars and planets fill this film to the brim. Lava lamps (actually filters applied by injecting colored dye into a container of water) like screens that reminded me of my favorite Godzilla movie Godzilla Vs. Hedorah and its liquid color scheme. To be honest though, these were the special effects that I quite enjoyed and considered positives of the film, but to list the ton of fake-looking shots would only besmirch what looked good in Star Crash. I should have mentioned this earlier; one of the men behind Star Crash’s special effects was Armando Valcauda, who happened to also contribute costume and creature designs. 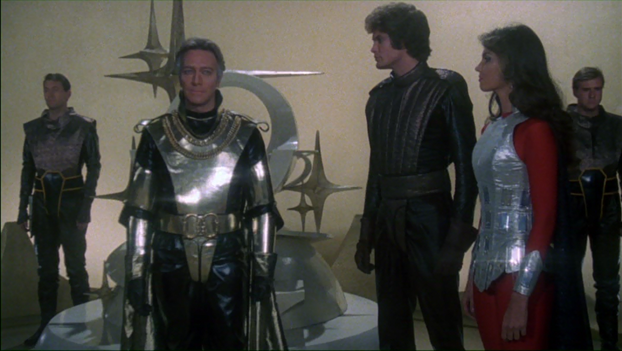 So that cool red and black jumpsuit Akton wears, that menacing form that constitutes Elle, and the Emperor of the Galaxy’s gold chainmail might just have come from Armando Valcauda. Those awesome looking Count Zarth robot swordsman were also created by him, as well as the amazon’s warrior protector. Star Crash instills that hand crafted charm that is what I believe is missing from today’s GC world. Pros: Sports a John Berry soundtrack heavy in brass that tries its hardest to make Star Crash epic. The concept that Elle who was originally hunting Stella and Akton, but then joins them and becomes a good companion with Stella is not only a cool concept, but allows for at least a little characterization. Certain stylistic choices and design elements are pleasant eye-candy, and this release has an in depth Armando Valcauda diary feature that I strongly suggest watching. Cons: The acting is stilted and dreadful, to the point that I cringe whenever someone (usually Stella) delivers lines. It honestly broke me down, a person who usually believes that acting can only help a film. This relates to how I did not care to plug in a picture of Count Zarth (who is by far the first villain in quite some time that I have not rooted for instead of the protagonists). Like the acting stated earlier, he left no impression on me. Many of the special effects are far funnier than being actually engaging. Star Crash broke me down and made me realize what type of reviewer that I am, one that often focuses on components and elements instead of the work as a whole. Star Crash is messy from start to finish, even including a drawn out space battle long after what I expected to be the films’ climax. I would suggest this film to anyone who appreciates those hands on special effects of yesteryear or someone looking for a good “friends get together and watch a goofy/campy flick”; anyone else would be wasting their time. Judges’ balancing stand thrown out in the case of technicality, I seemed to have appreciated this film more then I enjoyed it. This could be said about anything in Shout! Factory’s Roger Corman’s Cult Classics label. Star Crash can be truly a divisive film, consume at your own risk. Review copy provided by friend of CTBF Dan Goulde.